When we went through Irene last year I never thought of that experience as a training exercise. Both of us agreed we’d never voluntarily go through a hurricane again. But Sandy kind of crept up on us. We planned two weeks on Eleuthera to get the houses ready for Fred’s family at Christmas, to walk on the beach, to play tennis, to renew friendships. But instead we prepared for a hurricane named after my brother that was supposed to be just a tropical storm. Most of today was spent preparing on fairly short notice. We lowered the hurricane Kevlar shades and bolted them down. I pulled up all of the rugs and moved the furniture to the center of each room. We lined the windowsills with towels, brought additional towels over from the other houses, and grabbed sturdy yellow slickers from the boat barn. These were all things we learned were necessary from Irene, and it was a lot easier to do them at our leisure than at one in the morning with water flowing between our toes. The wind really started blowing in the morning. It rained intermittently, although last night the rain covered our eastern windows like sheets. There were enough breaks in the rain that we could take the dog out or walk next door without getting soaked. Still, the wind was blowing hard enough that a simple act of standing on the deck facing the ocean, drill gun in hand to tighten shade bolts, required leg muscles and balance. We went into Governor’s Harbour around noon. Most everything was closed but there were a good number of folks milling around. We watched the Gov Harbour police moving out of their station. They had Kalik boxes full of probably desk equipment and files, all stacked in the police van. They were towing a car that didn’t work. The police station is very near the harbour and after Irene it was half underwater. Burrows market and liquor store, now under one roof on the Queen’s Highway, was open and bustling. No bread…just like Atlanta before a snow storm…really, do people sit around during Mother Nature’s disasters and eat a lot of sandwiches? Otherwise we got everything we needed. There was a sense of determined optimism, a checking-off-the-list sort of mentality. They’d all done this before, knew they’d emerge ok, not looking forward to the cleanup but at least the water and wind would be gone. Coming back home we ate some lunch and Fred’s contractor Troy Sands showed up unannounced, asking if we were alright and did we need anything? Fred spent the better part of several hours with Troy and his helpers battening down what still was left to protect. It was very nice of Troy to come by and just one example of how everyone helps those they can during a hurricane. Getting through a hurricane is a community effort. Finally the preparations were done and Sandy started to show his/her strength. I think for the purposes of this blog I will just call Sandy a “him” since I can’t separate the name “Sandy” from my brother. Anyway, Sandy started to blow harder, and the rain really picked up. We napped a little and read a little and at 5:00pm I knew I had to feed Cupid and take her outside. Taking her outside was an adventure. I felt like Jim Cantore on the weather channel, except that I didn’t see any video cameras. As I approached the beach the winds were so strong that Cupid, probably wisely, would not go any further. It was high tide and the water lapped the dune grass. 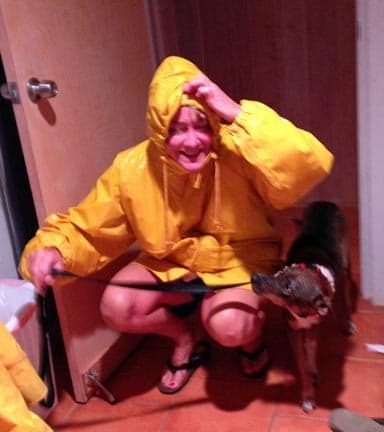 Cupid brilliantly did her duty—what a pup!…even in a hurricane!—and Fred let us in the downstairs door. Just opening and closing the door takes two people. We still have power thanks to the generator and Cable Bahamas hasn’t let us down yet…we still have internet and TV. Sandy is just touching us with his inner circle…apparently he is over Cat Island now and that means we’re next. We’re hoping he turns a bit more to the east as that would help us directionally with the wind. It’s going to be a long night. Stay safe. Love your new pup. Thank you so much for the update. All of us who are watching from afar have the Island and its people in our thoughts constantly. Be safe. Fellow Atlantans wishing you a safe night…thanks, Katie, for keeping us posted on our little piece of Heaven on Earth, Eleuthera! We have plans to visit again in March. Hope all our favorite people and places are OK! Take care tonight! Please stay safe, thanks for the update. I hope Sandy will be gentle on Eleuthera. Thinking of you both and hope all will be well with both of you , the houses, and beautiful Eleuthera! I send lots of love! Your missive was timed perfectly, Katie, as I had just this moment said to Martin I would check in for the latest progress report on the impetuous Sandy. . I am a nighthawk if you hadn’t already gathered and would welcome further updates as you are able. I always find it wildly therapeutic to write about everything that happens to me, well almost everything, and I sense perhaps you are inclined that way too. I am here and listening. And wishing both of you the safest night possible. Hang in there Katie. My friends and old sudents in Kingston seem to have come through with only moderate damage. Though it may be a while before regular power is restored..
Cupid is super cute. Keep her and you and Fred safe. Pam and I will be thinking about you. Thanks for keeping us posted. We’ve been glued to the reports and appreciate all the news from the island. We’re monitoring as best we can and thinking of you all in Govenor’s, Double Bay and Windemere. Potcakes Rule, as we all know, so I’d say that Cupid has figured it out, just like our Luna did in the winter storms of 2009 and 2010. Be safe, you do have a long night ahead, followed by clean-up. And, we’re glad that Jim Cantore isn’t there as then we would be doubly worried! P.S. I’ve never sat around eating lots of sandwiches in the aftermath of hurricanes. Although I have eaten lots of saltines and peanut butter! Thanks for the awesome update Katie! I love your writings and blog. I was directed here via Will or Jessie’s FB page. I hope you all stay safe down there, it looks like an amazing place. Sandy looks like no joke! I’ve not been paying attention and just found out about Sandy. Hope you, your neighbors and the island come through with minimal troubles. Sending my best to you, Fred and Cupid. Hope no-one has too much damage through the night……….. If anyone passes by my house please let me know. Our update is the safe arrival today of Taja and Matt’s son James this morning- 10lbs 6oz. Big, strong and gorgeous. My 4th grandchild in less than 3 years!!!! The best to you both and the pupdog. Stay safe. Thanks! Online info hard to find. Nassau Guardian web site appears to have no more updates since last night. Not hearing from sites in Abaco either. Stay safe! Please post any news about current island infomration on the Eleuthera Forum, if you don’t mind. Lots of people want to know the current situation, as of Friday, 10 am. thanks so much for the update — how is it friday at noon? Glad to know you’re ok. I’ve been wondering where you are. Rhode Island is in a state of anticipation. We just rode our bikes down to Snug Harbor to watch them taking some boats out of the water.The weather folks say it doesn’t matter what you call it – tropical storm or hurricane – it’s going to be a beaut when it arrives in New England. Be careful and keep us posted. Bliss and Michael P.S. Who is Cupid?? ?